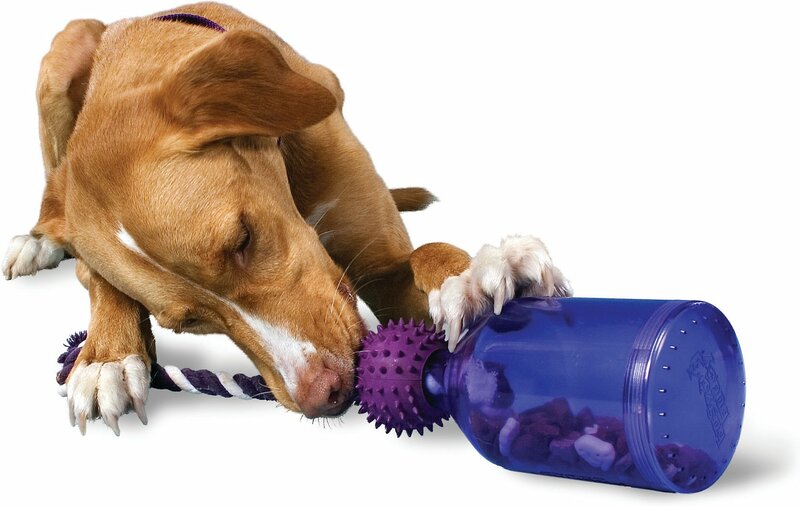 Busy Buddy's taking fun to a delicious new level with the Busy Buddy Tug-A-Jug Dog Toy! 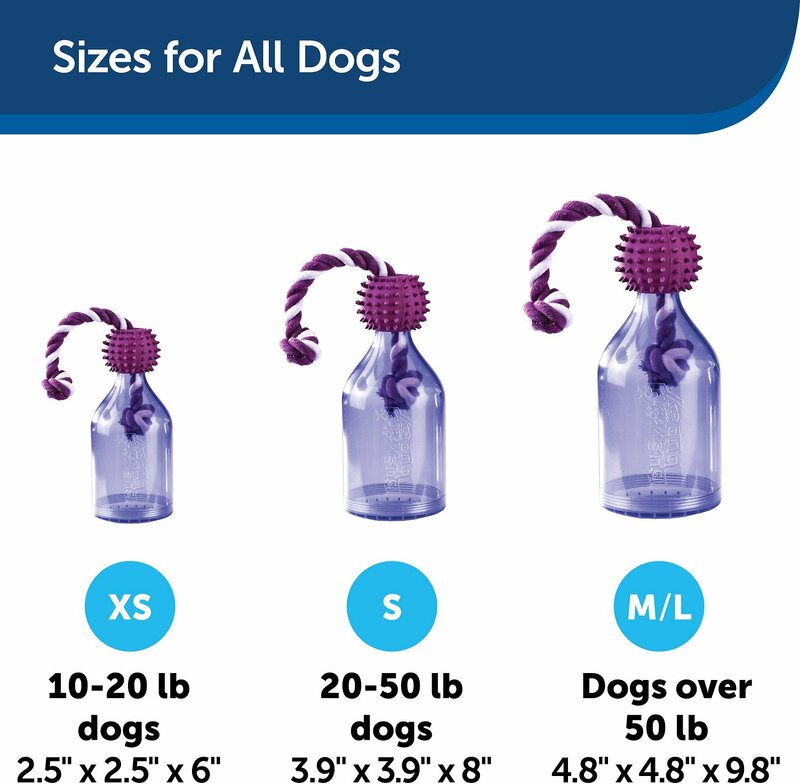 The Tug-A-Jug has a clear base that can be filled with kibble or treats, a nubby ball perfect for chewing, and a braided rope pups can pull to lift the ball and release the treats! 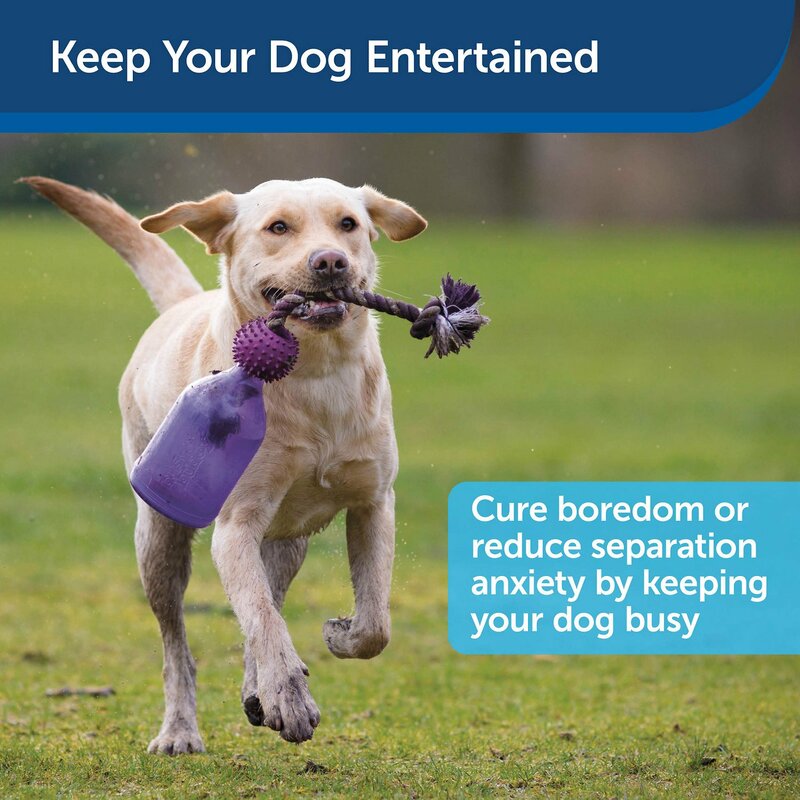 Pet parents can use the Tug-A-Jug to feed meals and slow down eating for pets prone to gulping, for interactive play with their pals, or as a brain-stimulating teaser to keep dogs entertained when left alone. Great Toy! But not completely bully proof! 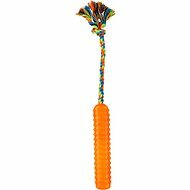 My first dog, my beagle loved this toy! It was her nightly ritual. We would fill it broken pieces of pupperoni and she would scoot it all around the house getting the treats out. She did this for years! After she passed and later we got a new dog, an English Bulldog. We didn't fill it with treats but she just loved moving it around, but quickly shredded the rope. She liked it, but definitely is better for some dogs than others. We had a good laugh, our tough bully took a toy that lasted almost a decade and she took it out in a week. Little stinker. Still recommend it. I bought this for my staffordshire terrier mix (45 lbs) thinking she could use some mental stimulation and a lot of slow down in eating time. Unfortunately, she doesn't seem to get the concept and incredibly would rather look at it in her crate than work any harder to figure it out. It does have a strong coconutty smell that makes it hard to smell anything else food related to entice her. I tried washing it to get some of the smell to dissipate but it didn't seem to work. I wish we had a better experience with it but it doesn't seem to be for us. I didn't return it as I don't want to pay the shipping, otherwise I would and go for something else. Shipment arrived today. Opened box. Opened toy. Filled with treats. Ten minutes later our active Shepherd/Husky mix had rendered this thing useless. That’s how long it took him to chew the rope in half killing the effectiveness of this toy. Hey Chewy! Back the product? Better product? I have had two of these for two different dogs ten years apart. The first dog figured out how to unscrew the lid. He would dump all the treats out at once and go wild. The second dog figured out how to unbraid the rope and pull it out. He was not amused by the treats coming out but carried the bottle around like a stuffed animal. Both loved the toy, but it lasted less than a month both times. I was very happy to see that this toy is now available in extra-small, which is more appropriate for my little dog. The size and quality are great, but one thing to note is that the rope in the extra small is the same size as the rope in the small, but the bottle opening is smaller in the extra small. This means less room for kibble/treats to fall out unless the dog is really good at working the rope. Still, it's a great toy and I'm sure he'll enjoy it more than the larger small size once he's had some practice. 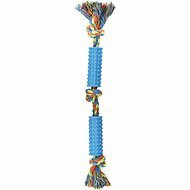 Used by medium and small sized dogs that are both good with treat balls and kongs. Neither were able to get this toy to have treats come out. Honestly hard for me to even get treats to come out. Idea is good execution is very poor. Would not recommend. 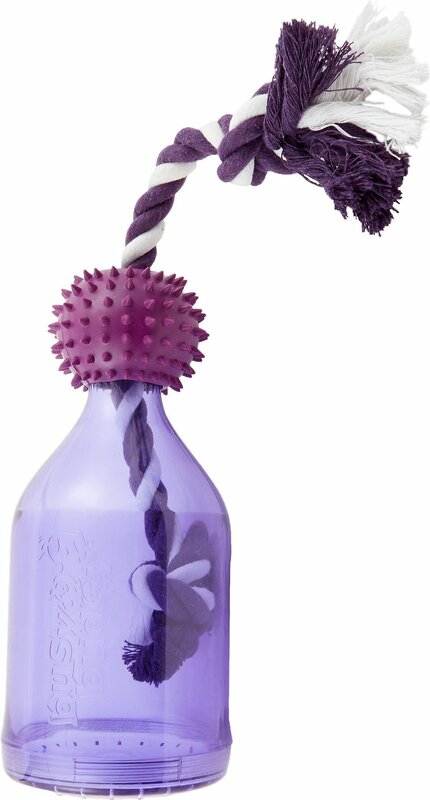 Almost impossible for my dog to get treats out of this toy. The knots on the end of rope almost always block the opening. Tries to chew through the hard plastic and I’m worried she’ll damage her teeth.